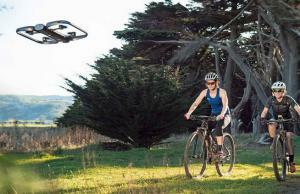 Cat In Motion Running Wheel: a running wheel that gives your cats a fun workout. It has an open design for safety. Litter-Robot III: an open air connected robotic litter box that automatically separates clean litter from clumps and drops the waste into a carbon-filtered drawer. Purrfect Portal Cat Door: a cat-shaped door for your basement and laundry room. Lets cats up to 20lbs pass. 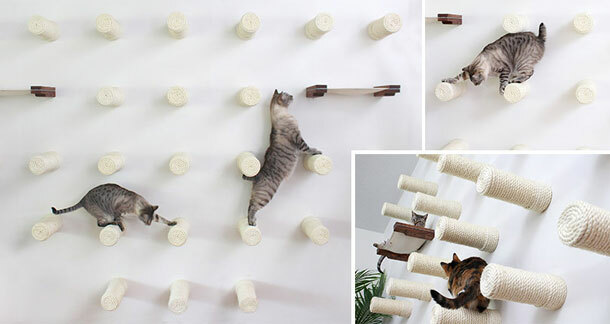 KATRIS: modular cat shelves that let you create a fun playground on the wall for your pets. 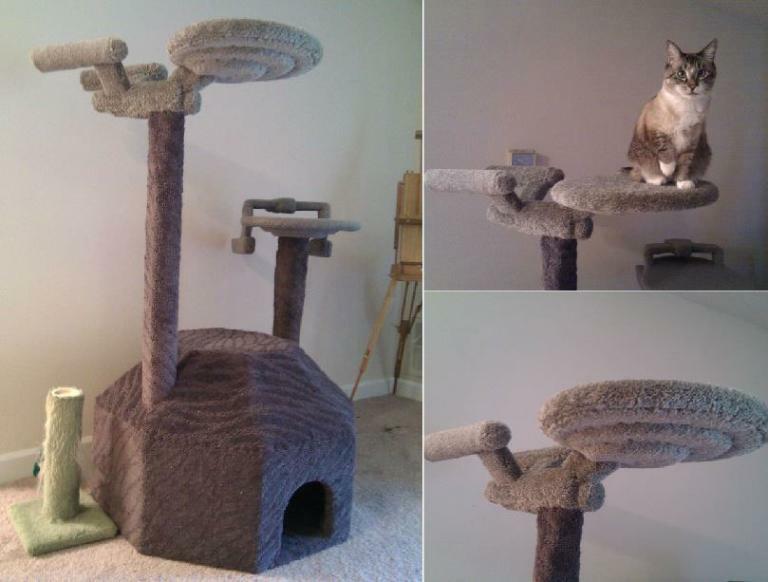 Star Trek Cat Tree: makes a wonderful gift for Trekkies. 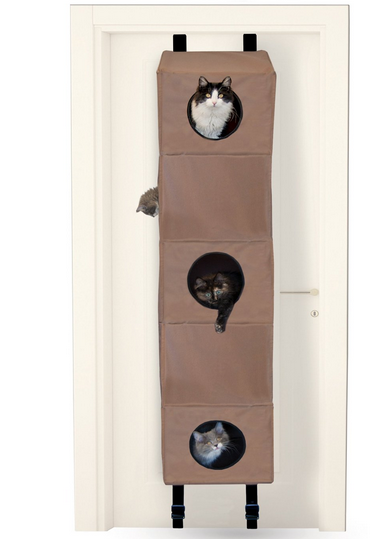 It provides your cats with multiple places to climb, play, and rest. Working T-34 Tank for Cats: keeps your cat protected and relaxed. 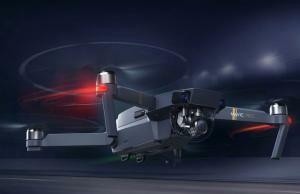 It comes with a moving barrel, 360-degree rotating turret, and hiding place for your pet. 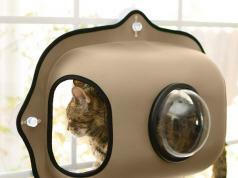 Martini Condo: a cute activity center for your pet with multiple openings and a hideout area your cat can curl up into. Texsens Bubble Cat Carrier Backpack: lets your cat see the world as you go for a walk. It works for dogs and cats. 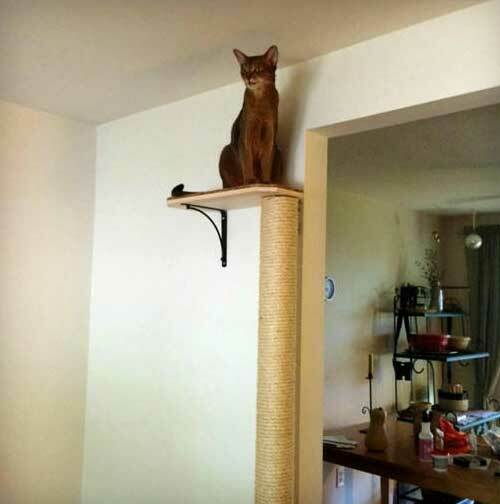 72″ Cat Scratching Post: tall enough to test your cat’s climbing skills. 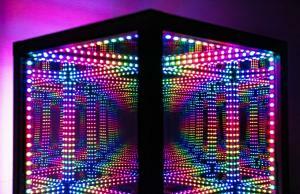 You can mount these to the wall with a single stud. These have a solid pinewood post with sisal or manila rope machine wrapped around it. Oscillot: makes sure your cats stay within your yard by preventing them from scaling over your fence. Imperial Walker Cat Condo: made for Star Wars fans. Its top opening gives your cats easy access to the top area. Gives your pets plenty of opportunities to jump up and down. On2Pets Cat Condo: an indoor tree for your pet that lets it jump, scratch, climb, and stay active. It is made from pressed wood, carpet, and artificial leaves. 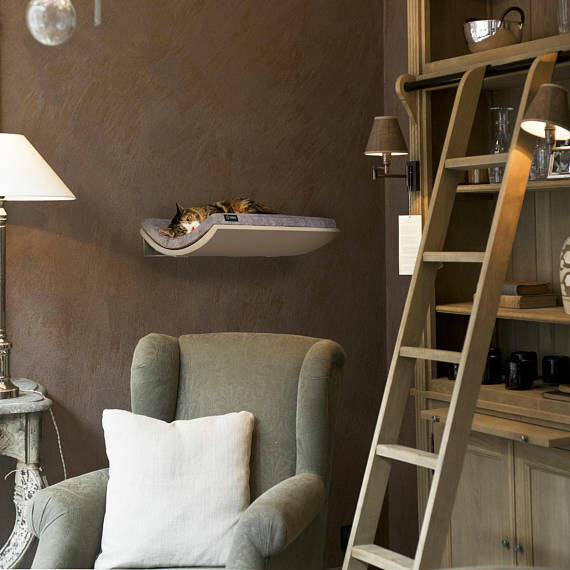 Chill Floating Cat Bed: a wall mounted cat bed with a curved wooden lounging surface that keeps your pet comfortable. 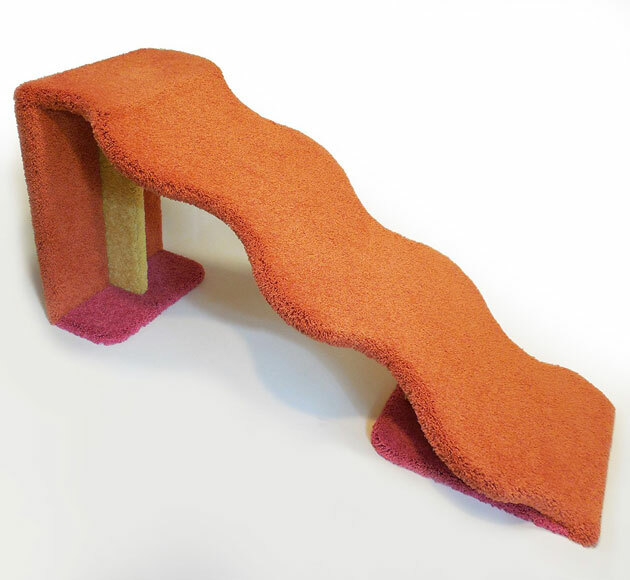 Wavy Pet Ramp: helps your old dog or cat reach an elevated couch or bed. 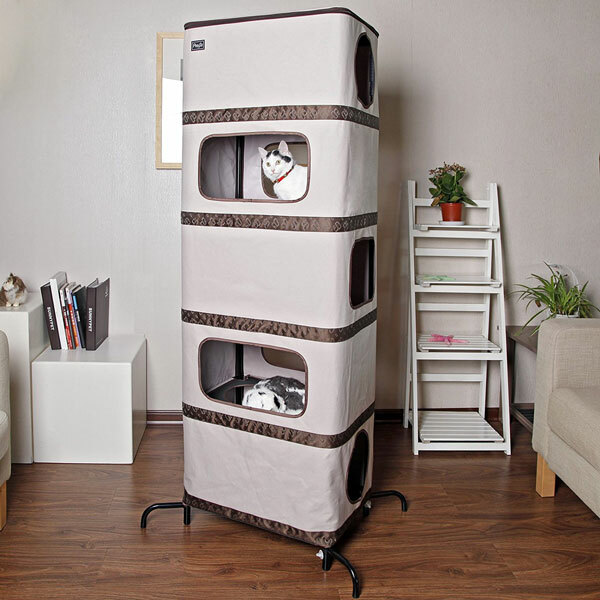 Maucelidom Cat Condo: a pet house with space for your cats to scratch, relax and play. 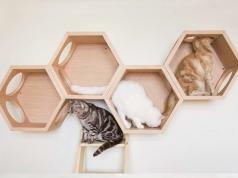 It is made of cardboard and has space for multiple cats. 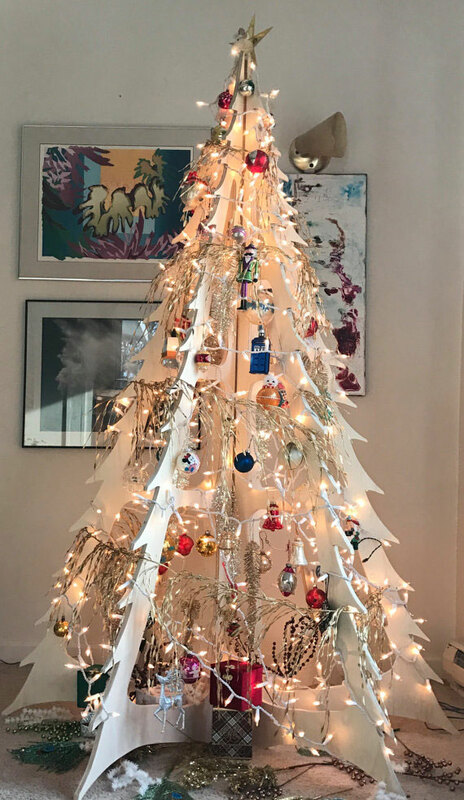 Cat Resistant Artificial Christmas Tree: stands 6′ tall and 4′ wide. It can be used as a full tree or half-opened. OMI Water Purifier: makes sure your dogs and cats always have clean water to drink. 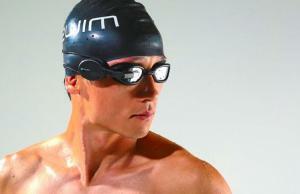 Its built-in sensor detects the quality of water and stops the pump when water is not healthy to drink. Indiana Jones Roped Cat Bridge: makes your home more cat friendly. Lets your cat relax at its center. Cosmic Tree Deluxe Condo: has space for up to 10 cats. 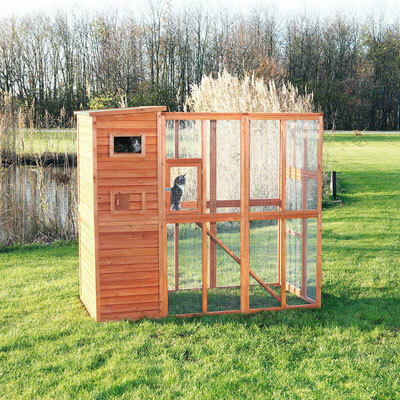 It serves as an activity center, enabling your furry friends to climb, hide, or relax. Licki Brush: a cute tool that lets you lick your cats. This synthetic tongue mimics the roughness of a cat’s tongue. Ludipuss: an interactive cat tank with laser, 360-degree turret, and scratching areas, hidden mice, and everything your cat needs to hide and play. Floating Sisal Post Steps: they can hold up to 62lbs of weight. 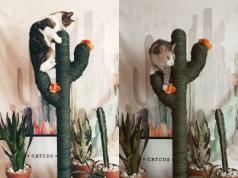 They are wrapped in natural sisal rope to satisfy your cat’s climbing and scratching urges. 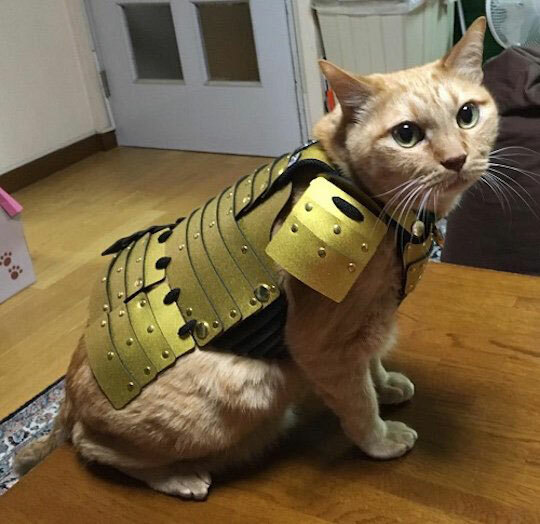 Samurai Pet Armor: accommodates cats and dogs. It is lightweight and won’t make your pet uncomfortable. 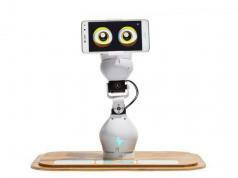 CatNani: a robot designed to keep your cat off the table. It also has an ultrasonic deterrent and a spray to train your pet. 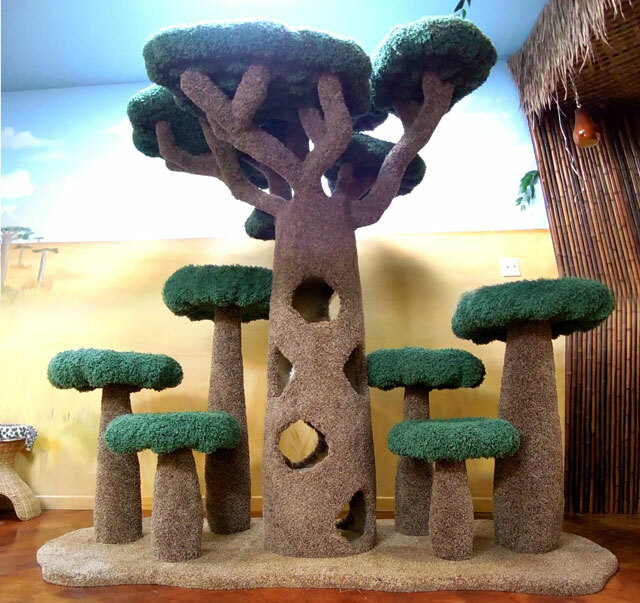 African Baobab Kitty Sanctuary: a giant cat tree with 4 levels and up to 6 small trees on the left and right to accommodate up to 15 cats. Cat Golf Course: a cute pet activity sensor with scratching posts, indoor golf grass, and a cat safe foam golf ball. Its retractable green can be fully extended to 75″. 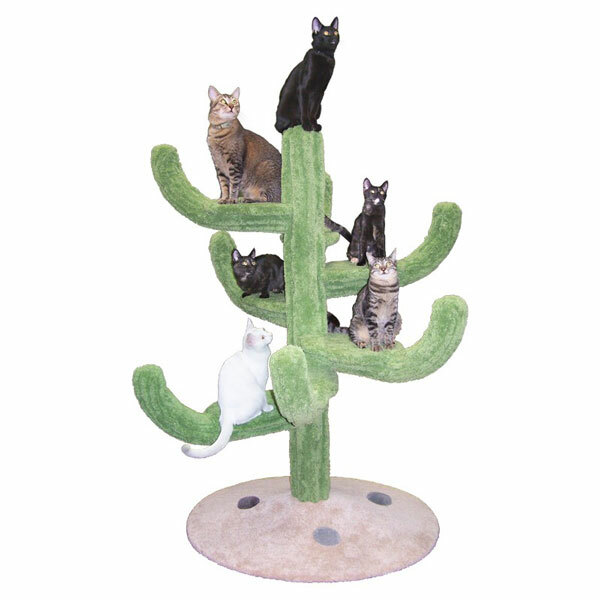 Cozy Cactus Cat Tree: has enough space to accommodate multiple cats. It has 6 arms and heavy base to keep your cats safe. Ultimate Savannah Sanctuary: measures 8 feet tall and has 8 condo areas & 5 scratching posts. Also has 2 openings at the top. Rubik’s Cube Cat Bed: a coffee table that also serves as a bed for your cat. It gives your cat a sense of security and privacy. 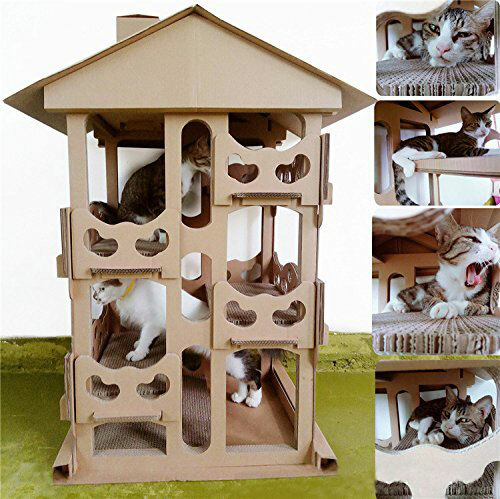 Catty Stacks: a modular cat house with a bridge. 2 cubes are good for cats up to 20 pounds each. Cat Tail Jeans: cute jeans with a tail for your cat to play with. These are created by Felissimo and Rinrin Yamano. Political Cat Scratching Post: want to let your cat play around with a Trump, Putin, Obama scratcher? These guys have you covered. Ripple Rug: a cat activity play mat that you can hide toys and treats inside. 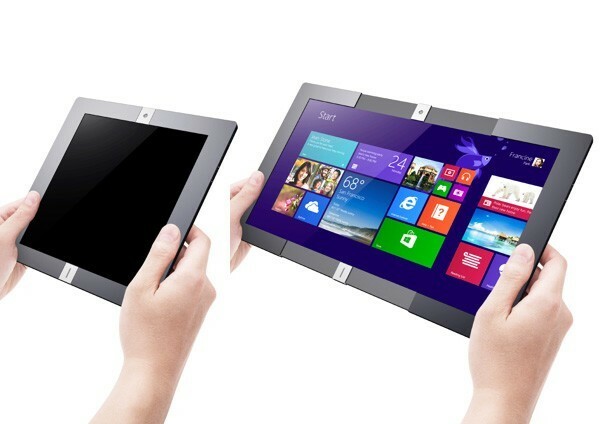 It has a non-slip bottom and stain resistant surface. Petsfit Play Tower Cat Tree: a multi-level activity center made of breathable materials safe for your cats. Trixie Wooden Outdoor Cat Sanctuary: protects your cats when they are outside. It has a ramp to give your cats easy access up and down. 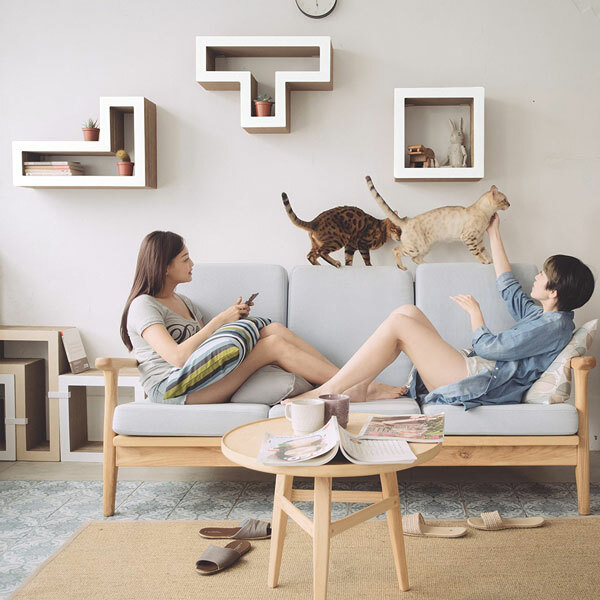 Kozy KittySitter: this cat house shelters your pet against bed weather and strangers. It gives multiple cats privacy. Caribbean Palm Cat Tree: provides your cat with a place to climb and scratch. They have replaceable pieces. 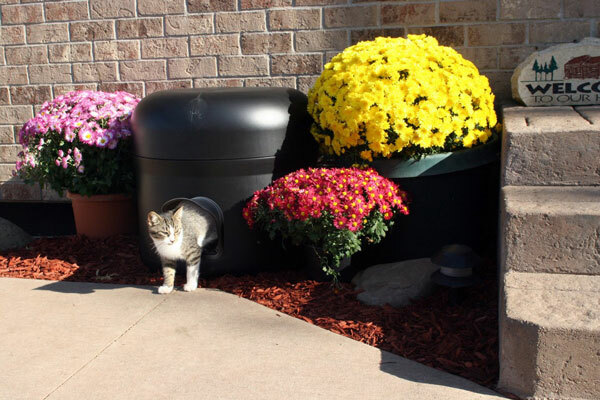 Kitty Tube: an insulated cat house for your own or feral cats. It has insulated floor, walls, and roof. 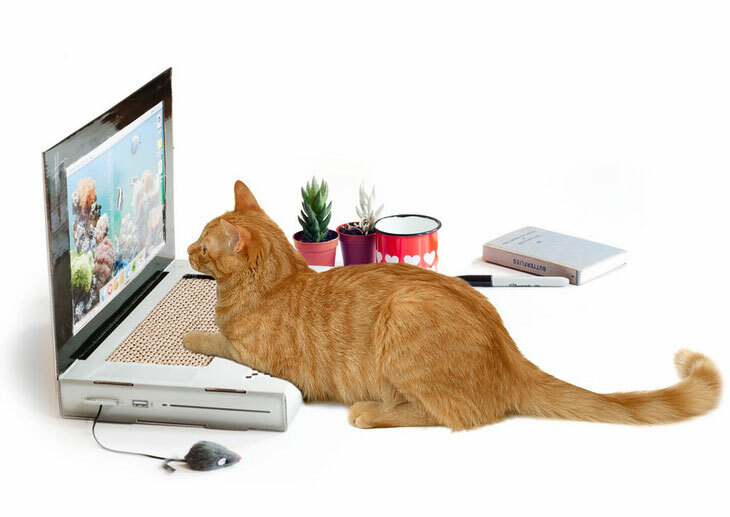 Cat Scratch Laptop: a laptop shaped scratcher with customizable desktop wallpaper. CatchCats: a smartphone enabled cat toy with a sensor that detects movements of your cat to move the fishing rod accordingly. 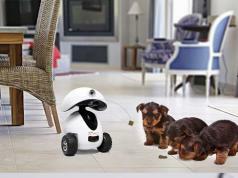 6 Legged Robot for Cats: this cool robot can be combined with fun toys to keep your cats engaged. Have you found cooler gift ideas for cat parents? Please share them here.